Microsoft has published their financial results for the 3th quarter of fiscal year 2016, and the company reports a decline in Xbox hardware revenue. 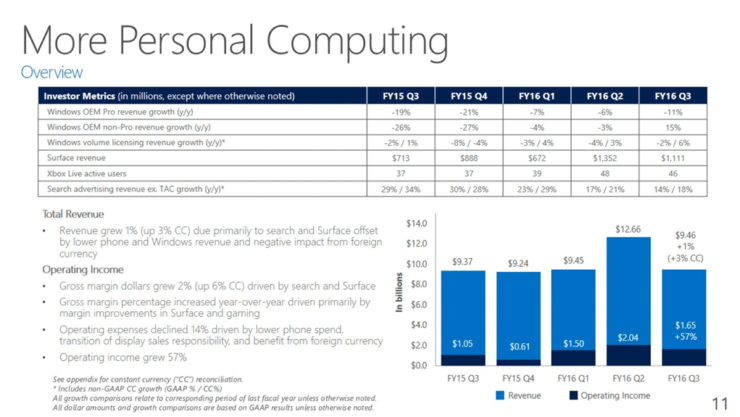 Microsoft’s Gaming division is (financially) categorized within the company’s ‘More Personal Computing’ segment, which experienced a total revenue growth of 1%. 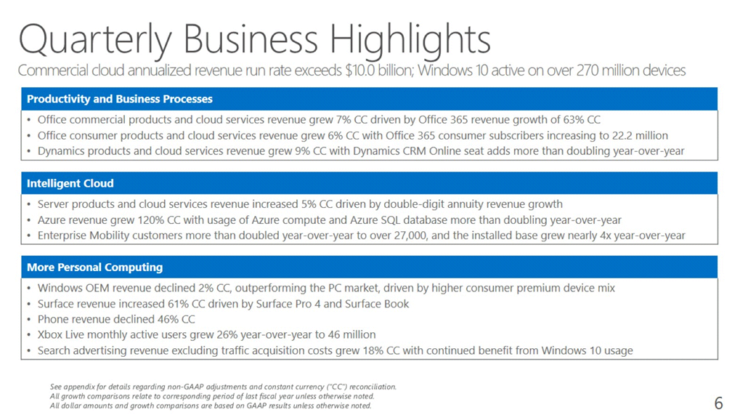 Within the segment, Xbox Live revenue increased, “driven by both higher volumes of transactions and higher revenue per transaction as well as an increase in revenue” from Microsoft’s gaming studios. The amount of monthly active Xbox Live users increased by 26% year-over-year, “driven by the growth of Xbox One and Windows 10”. While Microsoft’s overall gaming revenue increased by 6%, Microsoft reports a decline in Xbox hardware revenue due to “lower Xbox One pricing” and “lower volumes of Xbox 360 consoles sold”. 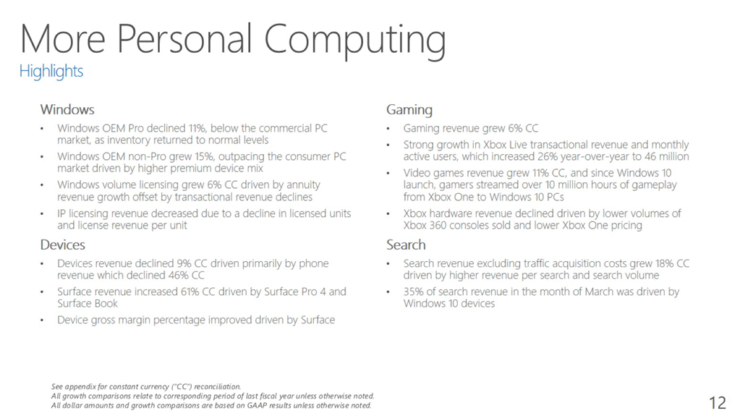 According to Microsoft, this hardware decline was foreseen though. In gaming revenue grew 4 percent or 6 percent in constant currency with continued progress in the monetization of our install base. We saw higher revenue from Xbox Live, driven by both higher volumes of transactions and higher revenue per transaction as well as an increase in revenue from our gaming studios. As expected, Xbox hardware revenue declined, mainly driven by lower Xbox 360 consoles sold and lower Xbox One pricing. Microsoft recently cut the price of their Xbox One to $ 299 for a “limited time” – the cheapest that Microsoft has ever officially sold the console since its launch. Earlier this week, Microsoft announced that it would stop the manufacturing of new Xbox 360 consoles. The Xbox 360 was in production for more than 10 years. “Xbox 360 means a lot to everyone in Microsoft. And while we’ve had an amazing run, the realities of manufacturing a product over a decade old are starting to creep up on us. Which is why we have made the decision to stop manufacturing new Xbox 360 consoles. We will continue to sell existing inventory of Xbox 360 consoles, with availability varying by country”, Microsoft’s Phil Spencer said in an official post on the Xbox Wire website. 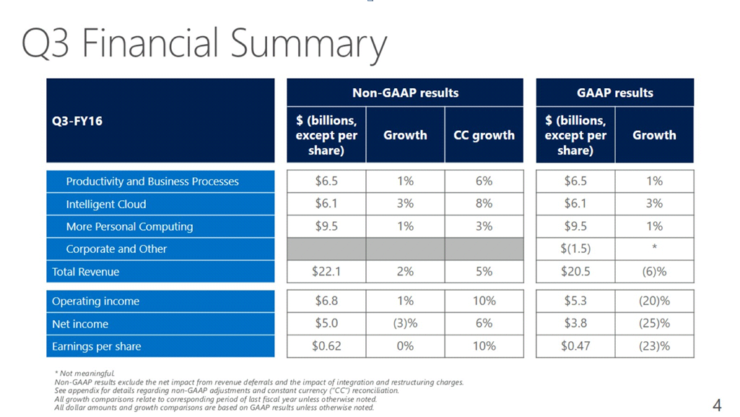 If you’re interested in Microsoft’s full financial results for their 3rd quarter, check out this page.